NEW YORK (WABC) -- A Lufthansa jet diverted to Kennedy airport Monday because of a bomb threat got the "all clear" Tuesday morning. The Port Authority said Monday Lufthansa Flight #441 from Houston to Frankfurt was diverted to JFK Airport after a bomb threat was called in. The call was made to Lufthansa corporate headquarters. The caller said that there was a bomb aboard the airplane. Headquarters notified the captain, who made the decision to divert to JFK. The plane was taken to a remote area at JFK. The Port Authority Police Aircraft Rescue Firefighter Unit and Port Authority Police Patrol officers responded to the scene. The NYPD bomb squad and Port Authority K-9 unit also searched the plane. The search found no device on-board. The plane involved is an A380, which is the world's largest plane, with 530 people aboard. 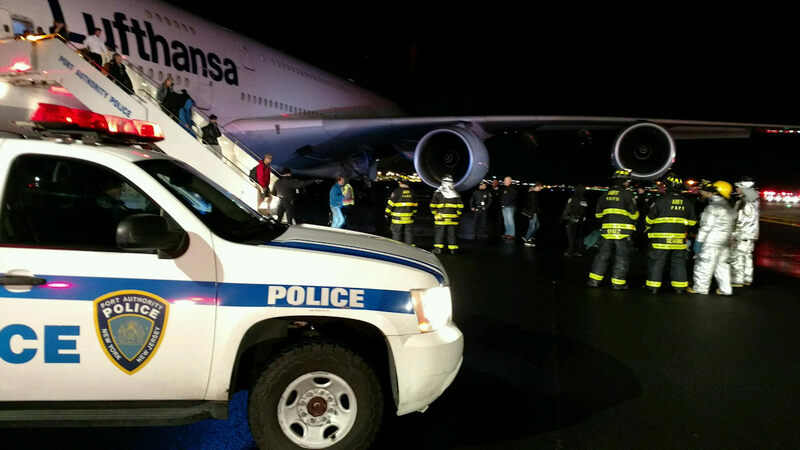 Late Monday night, Lufthansa released a statement saying, "The flight LH441 from Houston, Texas to Frankfurt was diverted to JFK as a matter of precaution and in coordination with the relevant authorities and the pilot. The flight landed safely in New York City at 8.34 pm EST. The passengers disembarked the aircraft and were shuttled to the terminal. LH staff will take care of the passengers. The aircraft will be searched since the safety and security of our passengers, crew and aircraft are always our highest priority." Lufthansa tweeted Tuesday morning that it was putting the flight's 530 passengers in hotels and rebooking them on other flights to Germany.